Piero Santini was a Major in the Italian Light Horse Cavalry. He was born in Rome in 1881 and died, also in Rome in 1960. He was a student of Federicao Caprilli and made it his mission to spread Caprilli’s forward system of riding throughout the English speaking world. 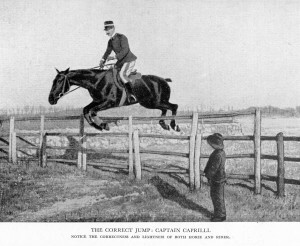 He was an advocate for following Caprilli’s method without deviation and stressed repeatedly that the forward jumping seat was one small part of Caprilli’s system as opposed to its focus. A hunting accident in 1930 ended Santini’s riding. It was then that he he began teaching about Caprilli’s forward system all over the world. He published his first book, Riding Reflections, (Derrydale Press, New York) in 1932 and followed it with a 2nd book, The Forward Impulse, (Huntington Press, New York) in 1936. Both of these books are based on Caprilli’s principals of forward riding. In 1942 he published, Learning to Ride, (World Publishing, New York) which was published again in 1952 (in England) under the title, The Riding Instructor. These books give valuable insight into Caprilli’s theory and system and contributed significantly to the development of the forward seat in America. Piero Santini’s mother was American and his father was Italian. He had a strong grasp of both the Italian and English languages, consequently he was able to translate Caprilli’s writings from Italian into English. Santini translated from Caprilli’s Principi di Equitazione di Campagna, his Istruzione Preliminare dei Cavalla e dei Cavaliera in Campagna, and other of Caprilli’s notes. He tells us that we would not have had these had it not been for Caprilli being sidelined from an accident, during which time Caprilli dictated his method to his friend, Bianchetti. The translations were published in Hoofs and Horns (1953-1954 Australia). Caprilli’s writings were also published in England during this same time period. In 1967 J.A. Allen & Co. LTD, London published The Caprilli Papers. Caprilli dictated his ideas fairly early in his career (1900-1901) and because of his early death, did not have many years to see them in action. It’s possible that, had there been more time, Caprilli’s ideas would have evolved farther. As Vladimir Littauer points out in The Development of Modern Riding, Caprilli didn’t have the advantage of movie or even frame by frame film. Santini was a die hard Caprilli devotee. Some of the strong points in Santini’s books; such as his emphasis on various wrist actions and his preoccupation with angles, seem to be his emphasis and a case could be made that here is the beginning seed of the preoccupation with the perfect cookie cutter position while riding. But then one might consider how hard it must have been to explain this new “seat” in writing. Caprilli’s writings seemed to be more concerned with the horse and the rider’s lack of interference, than how hands were held and ankles bent. Santini was Caprilli’s loyal defender, trying to make certain that credit was given where credit was due. His belief that one had to follow Caprilli to a T is a little bit tainted (IMHO) by Santini’s own interpretation of Caprilli and his personal experiences. This is a fairly common situation in the horse world, one that you see today, particularly in the natural training movement. A student will accept their mentor’s ideas as gospel, while the mentor is still flexible, experimenting and learning, at which point the student becomes more enthusiastic about the purity of the system than the originator. This causes heated debates and passionate arguments, all of which is nothing new to horsemanship, nor is it harmful. One only has to read Santini to realize he could get pretty “hot under the collar” about forward riding. Both Caprilli and Santini were well schooled in the art of classical riding. I find it a little unusual to think that a person who has learned classical riding would be able to abandon all of the actions of the one for a totally new system. Perhaps I could believe it of Santini, as follower, but not so much of Caprilli, as an innovator. I think perhaps Santini’s insistence that one could not incorporate anything from classical riding into the forward system was a little severe. He claimed that the seat taught at Fort Riley was closer to Italy than its 4000 miles. The other thing I find interesting about Santini’s books is that although he states that the purpose of the forward seat is for riding in the open, much of his instruction takes place in the arena, particularly in his book The Riding Instructor. Santini was never afraid to state his point, whether it was his dislike of amateurish amateurs or his opinion that horses from the show ring were useless for practical purposes. In Riding Reflections he disdains horse shows while at the same time he was known to frequent the shows on Long Island. By the time he wrote The Riding Instructor, he had developed guidelines for a competition for boys and girls, to be held in a riding ring. One might think that even Santini yielded to the modern world and the changes that were required by the new riding public, much the way Littauer developed his style for the civilian public. Santini was one of two direct Caprilli students to leave us the written word; the second being Col. Paul Rodzianko. After his time with the Italian School, Rodzianko returned to Russia to teach at the Imperial Cavalry School. Revolution caused him to leave Russia and teach riding in England. He was also the instructor for the Irish Free State Cavalry School. His book, Modern Horsemanship was printed in Great Britain in 1936. Rodzianko was trained by Fillis and Caprilli and is an excellent read and comparison to Santini. Beyond Santini and Rodzianko, our next source for Caprilli education comes from Col. Harry D. Chamberlin, who studied at the Italian Cavalry School in 1923. Chamberlin brought that training along with time at Saumur, France, back to Fort Riley, creating the foundation for the Fort Riley Seat/balanced seat. After Chamberlin came Vladimir Littauer who was not a direct student of Caprilli or even of the Italian School but he was a great student of horsemanship. He trained in Russia with James Fillis before moving to the United States. Littauer was a prolific writer and was on his own journey in horsemanship. But more about these men in another post. My intention in mentioning them is to point out that there is a small handful of early followers that have given us books on horsemanship relating back to Caprilli. They were all great horsemen, seeking a common goal and purpose, each with a slightly different view, well worth studying. In 2011 Dan Gilmore finished his own translation of Caprilli’s writings. He has generously made this translation available for anyone to read on his web site http://www.gilmorehorsemanship.com/caprillinaturalsystem.html This is a gift to horse men all over the world as it gives us a fresh view of Caprilli’s intention. I strongly recommend that you visit Gilmore Horsemanship and view Dan’s work. Check out his other articles and blog for very interesting posts on a variety of topics related to horsemanship in general. Bravo ! Excellent ! An account of Caprilli which is long overdue. (But then I am possibly a little biased). Caprilli died in 1907 and Chamberlin attended in 1923 so although he was at the Italian Cavalry School he learned from students of Caprilli – sort of second tier. Rodzianko was still at Pinerolo in 1907. I have not found the years for Santini yet but both Rodzianko and Santini had direct contact with Caprilli. Can you imagine it? Wow! Thank you so much for these articles on Caprilli. After riding Forward Seat for decades I was diagnosed with MS. I decided FS was the most secure seat physically for my problems (lack of balance, proprioceptive sense, etc.) and that the FS system was the best way to prevent the horses from hating me riding them. During the past decade I have often wondered if Caprilli had lived longer if he would not have ended up in the ring himself, developing the Forward Seat on the flat. I can understand that physically normal people riding FS are busy having FUN galloping and jumping cross country, but for us disabled people, not to have a FS system based on flat work leaves us hanging, tempted by dressage etc.. So I have been working on that, mostly at the walk and some trot. Wherever “balanced seat”, “safety seat” and dressage authors insist that the horse needs to be collected before trying something, I work on proving that the work can all be done with the horse deciding his own degree of collection (usually none). The horses I ride stride forward freely at the walk, trot willingly on the days that I am strong enough to keep my balance. God bless Caprilli, Santini, and Littauer. Without the system these men developed I would be only fit for pony rides, being led with a spotter on each side of me. With the FS I can still RIDE independently and effectively without torturing the horses. Thank you for the article. I will start a search for the books…next week. I think Caprilli was about the idea of being with the horse. Dressage people also work with the horse (some I guess… The people I rode with). Not the show ring dressage but the training, riding people. I think that is common for the student to become fixed, whereas the teacher evolves. It takes a certain mind to develop a concept. It perhaps is good that Santini kept to Caprilli’s teachings. One question I have…eventers lean back over drop fences…shouldn’t they be forward? Caprilli was very interested in the psychology of the horse. On the riding side he was most interested in letting the horse use his natural balance and having the rider not interfere with the horse. This is a little bit different than dressage because dressage works to bring the horse’s balance more toward the center; the rider’s goal is to change the horse’s natural balance. There are considerate dressage riders and some pretty cruel ones, just as there are in most riding venues. Dressage used to mean training not sport. Regarding your question about drop fences (and I would add into water)- it would not have been Caprilli’s way of jumping them but I think most eventing riders are not Caprilli followers. Eventing has changed so much with much higher demands in dressage. I think probably Caprilli would cringe. Or he would find a way to help the horse a little bit more. And many thanks for the kind words, Barbara!